A new era is set to begin for the Archbold boys basketball program in 2018-19, albeit with a familiar face leading the way. Joe Frank, 57, will slide over on the bench from his position of varsity assistant and head coach of the junior varsity squad, to take over as the head man this winter. He wasn’t sure if his time would ever come, but when longtime coach Doug Krauss stepped down after last season, he jumped at the opportunity. Frank, a 1979 graduate of Archbold, has spent pretty much his entire teaching and coaching career at his alma mater. After getting his degree from Defiance College in four years, he taught for a year at Oregon Clay before returning to the place he grew up. He joined the basketball program as JV coach in year two at Archbold. It was a position he held throughout Krauss’ tenure. But why agree to take the keys to the program now? The answer was simple for Frank, this is his dream position. Frank has the full support of the administration. Gladieux is obviously familiar with Frank, not just from basketball, but when he served as head softball coach for 15 seasons before stepping down in 2016. Frank will likely apply the many lessons he learned from watching coach Krauss during his illustrious career – a career that included 561 wins. Under Frank, the Bluestreaks will still make defense their number one priority. And if they work hard and show attention to detail, everything else should fall into place. Gritty and hardworking would be adjectives used to describe the Archbold teams under Krauss. Frank is looking to continue that tradition. However, there may be some slight changes under the new regime. 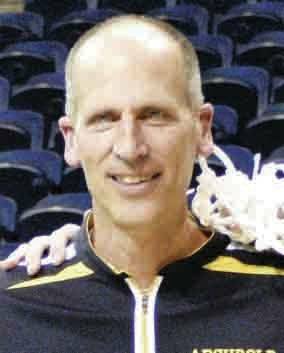 Given the success of the program under Krauss, pressure comes with the territory of being head basketball coach at Archbold. Frank feels he is up to the challenge. The new coach did not want to speculate as to how long he could coach, but it was clear he is committed to the future of the program. “As long as I feel like I’m providing the kids an opportunity to have some success and put them in position to succeed,” he said. “I’m enjoying it and the kids are enjoying it. Like I said, I’ll take that year by year.